Tanaka is a company who have made some really impressive chainsaws over the years, but the question on many peoples mind is who makes Tanaka chainsaws and are they any good?. How do they stand up against the heavy hitters like Stihl and Husqvarna?. Since Tanaka is a brand I have used for about a year now, I wanted to learn more about them. I like to learn about manufactures of chainsaws regardless of how well they perform. Because I believe you can learn a lot about a product once you have a good understanding of the companies policies and beliefs. Not just about where they started and where they were made, but learning the story of a company. Knowing a companies history will help you make a more informed decision when it comes to purchasing power tools such as a chainsaw, especially when heavily investing into a log splitter. Personally for me I would find it hard to spend upwards of $800 on a chainsaw if I knew a company was facing financial issues. Since there is a chance they could go under and they won’t repair your tool under warranty. While that is an extreme example, it does make you think. 1 Are Tanaka Chainsaws Any Good? 1.1 Are Tanaka Chainsaw Any Good? 2 Where Are Tanaka Chainsaws Made? 4.1 When Did Tanaka Chainsaws Hit The USA? 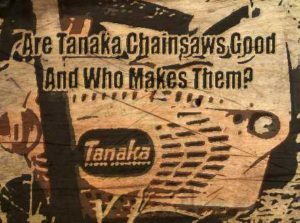 Are Tanaka Chainsaws Any Good? As with any tool you can really only relate to your own personal experiences with it. The first thing I notice when I see people leaving negative reviews is half the time they barely did anything to even try and fix it. Which is why in my Tanaka chainsaw reviews you can get the whole breakdown, including the negatives associated with each model of chainsaw. Certainly there are times you will buy something and it breaks earlier then expected, this happens regardless of the product. It’s unavoidable unfortunately. I’ve seen people buy brand new $80,000 cars and they break down literally only hundreds of feet down the road from the dealership, it’s frustrating but it happens. Are Tanaka Chainsaw Any Good? 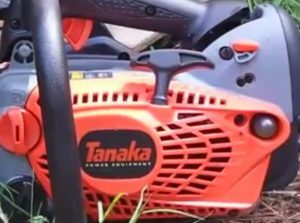 From my personal experiences using several Tanaka models over the last year or so, I can confidently say they are a top notch and affordable chainsaw. I find them very impressive little chainsaws that have a surprising amount of power, from some smaller engines. They have been some of the surest starting gas chainsaws I have ever used, which is why one of there cheaper top handled saws is a favorite among Arborists. Not everything is perfect on them that is for sure, I have noticed on several chainsaws that they do have tension issues. This is really only a small complaint in the grand scheme of things, but something that I do feel I have to mention. 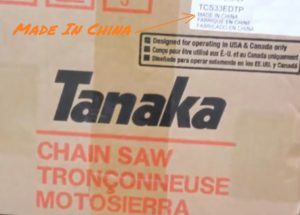 Where Are Tanaka Chainsaws Made? Where Tanaka chainsaws are made is quite a difficult question to answer. I know there older models are made in Japan and are some of the finest chainsaws out there. The modern Tanaka chainsaw is now owned by Hitachi who manufacturer a lot of there tools in China. A lot of the lower priced chainsaws are made in China, which is just the way things are going now days. Companies need to continue to make more and more for growth, while I do find the Tanaka chainsaws made in China still to be of a higher quality. Since they are still designed in Japan. With that in mind some of Tanakas high end hedge trimmers are still made in Japan, so there is hope in the future is Tanaka continue to make some professional grade saws they will be made in Japan. Hitachi are also responsible for making some amazing power tools as well, you’d be hard pressed to go to a job site and not see a Hitachi tool somewhere. There are really only a few places you can Tanaka chainsaws in this day and age, with most places being dealerships or big box stores. Tho there are places online like amazon who does sell a few quality Tanaka chainsaws. Personally I prefer to buy online, I don’t like having to deal with driving to a store and listen to a salesman, who barely knows anything about the tool they’re trying to sell me. So I really like online since you can read reviews from people who have actually put down there own hard earned money, and have actually used the chainsaw. So they know more then someone who just read a pamphlet. However, if you want to buy Tanaka Chainsaws instore, you can visit their homepage and click on the retailers store locator. Check out if there are any Tanaka chainsaw dealers in your area. It certainly won’t hurt to compare the prices on amazon,com once you have visited instore. I found the history of Tanaka to be quite fascinating. Being a fourth generation family company gives it a certain level of trust and reliability in my eyes. If you had your family name on something, would you want to risk ruining it by making something inferior?. Tanaka was founded in 1918 by a man known as Takashi Tanaka in Japan. It wasn’t until about 1948 that he built a manufacturing plant that spent countless hours researching and developing compact internal combustion engines. They were a leading manufacturer in the plane industry who were known for the high levels of accuracy. They then turned there attention to making moped engines in 1951, by marketing a 125cc motorcycle engine. They kept focusing on this larger engines for several years and it wasn’t until 1962 where they made the worlds smallest industrial general purpose 2 cycle engine. 3 years later Takashis son, Sieken Tanaka took over the company, with the ambition of making the company go international. It really wasn’t until about 1968 that they did start to export engines to North America. It was 3 years after this that Tanaka finally made there first chainsaw and hedge trimmer, which they started to export to North America. They did create a really solid outboard motor that became a private label motor for Sears in 1974. After this Tanaka decided to expand yet again, but to make smaller 23cc bicycle motors. When Did Tanaka Chainsaws Hit The USA? Finally after 60 years Tanaka had broken into the American market and opened a USA branch in 1978, to help assist with the sales in America. This was a separate company but still under the Tanaka name, which acquired a small mail order company. In 1985 Tanaka moved its whole operation to a facility in Bothell WA. This is where it gets a little confusing since the new American Tanaka company gets purchased by the Japanese Tanaka corporation. But they are both still operating under the two different Tanaka names. They still operated out of the USA and retained there American name and exclusive marketing rights for Tanaka North. By 1989 the American Tanaka rights were purchased by Ariens company, who made a subsidiary called Ariens Tanaka. This was established to help continue the marketing and supporting the Tanaka products. Sadly this was a short lived partnership which after Ariens made a brand 2-cycle hand held products, made by Tanaka. They split ways in 1992 with 5 of the Tanaka members going on to make ISM. It went really quiet for for many years and it wasn’t until 2007 that Hitachi Koki Company acquired Tanaka and proceeded to create two different branches. One to focus on Japan which was called Nikko Tanaka Engineering Co which conducted manufacturing and sales in Japan. With the other branch being the Nikki Tanaka Engineering USA CO which handle the sales and support in the USA. By 2009 Nikkio Tanaka Engineering USA Co was fully taken over by the Hitachi brand. Who have the goal of trying to create a team based around two powerhouse Japanese power tool companies. While the story has been interesting up to this point, this is where it really ends, since the two companies have been working together since then. With very little happening since the acquisition. I really like Tanaka equipment, the easy starting and well priced equipment has impressed me over the years. I’m a little sad that they’re not there own independent company anymore, but it hasn’t seemed to stop them from making quality chainsaws. But I can understand people who don’t want there products to be made in China, since it is always a gamble. But I feel it’s a gamble no matter where something is made to be honest. I’ve bought made in the USA and paid twice the price and unfortunately the machine broke immediately, owned a Stihl MS 241 and had issues from day one. It will always be luck of the draw on any power tool you purchase, just don’t let it stop you from trying something like a Tanaka chainsaw.